From its very first edition until today, iOS has been an example of how you build a super-smart and super easy to use mobile operating system. It is the software that spawned a revolution in the mobile space, leading to the proliferation of smartphones as primary tools for content consumption, web browsing and much more. 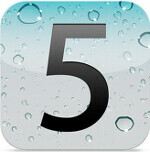 Now, we've just been treated to iOS's latest major update, called iOS 5. The newest version of the software brings a lot of new features, some of which should be considered pretty important. Of course, there will be people who find the new stuff perfectly enough, and such who'd rather say that they are not really impressed. We can't judge who is right and who's wrong, because every user has their own needs, which may or may not be met by what iOS 5 offers. But there's only one way to know that! Let's dive into the new iPhone operating system and explore the new features that it has in store for us! Probably one of the most important additions to iOS 5 is Notification Center. We've all encountered those annoying pop-ups that always come on top and interrupt what we do. Well, now these are gone, and upon receiving a new message, for example, a small notification will show up on top of the screen, and then quickly disappear. From then on, identically to Android, you only need to swipe downwards from the upper edge of the screen in order to access Notification Center. There you'll find such stuff as new messages and email, calendar alerts, social networking and app updates, as well as widgets for stocks and weather. Notification Center is a pretty useful tool, as you can imagine, especially when you know that those notifications now appear on you lock screen as well, so you don't necessarily need to unlock your device to see what's going on. However, it isn't perfect yet. It would have been cool if developers were allowed to create Notification Center widgets for their own apps, but for now, we can only hope that third-party support will become available at some point in the future. Another major new feature is iCloud. Thankfully, this isn't just a simple cloud back-up service – it's nicely integrated with your iOS environment. For starters, iCloud offers you a free web-based email service (@me.com), as well as syncing of your contacts and calendar. But it does a lot more. It will also keep your reminders, bookmarks, notes (if you have set an @me.com email account), photos, music, documents and apps. Now, when you purchase new songs from iTunes, or apps and books from the App Store, those purchases can automatically download to your other iOS devices as well, which is pretty convenient. Of course, you can also download previously purchased songs individually from iTunes, if you don't want all of your music to be automatically fetched. Document management is also greatly simplified due to iCloud. For example, if you're working on a Pages doc on your iPhone, and you're done for the moment, but plan to continue later on your iPad, you basically won't have to do anything, because the doc will automatically sync with iCloud, and from then – with your iPhone. Right now, apps from the iWork suite support this functionality, but third-party programs should be able to add support soon as well. Photo and video back-up is an interesting aspect of iCloud, which we'll now try to explain in a clear manner. Your photos and videos can be backed-up on iCloud, but naturally, that counts against your storage space. There is a way to keep your photos (no video) on iCloud, without this taking from your precious gigabytes, but there are some limitations to it. This can be done through the service Photo Stream. 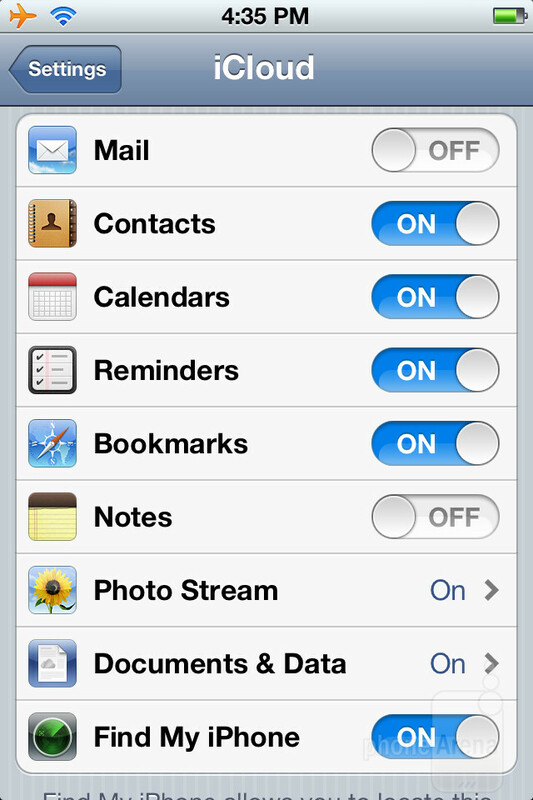 When you turn it on, the photos that you take will automatically be uploaded to iCloud, where you'll be able to access them via icloud.com, or your other iOS 5 devices, which are using the same Apple ID. The limitations to the service are that you can have up to 1000 photos uploaded there, for as up to 30 days each. So, when a new photo is backed-up using Photo Stream, it will be removed from the cloud after 30 days, unless you move it to an album of some sort on some of your devices. Indeed, the chance to lose your photos just like that, because you've forgotten that you are supposed to move them to an album, could be the cause for serious frustration, but let's not forget that this is just an additional treat for users, something extra to the normal service of cloud back-up for your photos. The initial, free offering for iCloud grants you with access to 5GB, but you can add more storage, and prices are as follows: 10GB for $20 a year, 20GB for $40 a year, or 50GB for $100 a year. 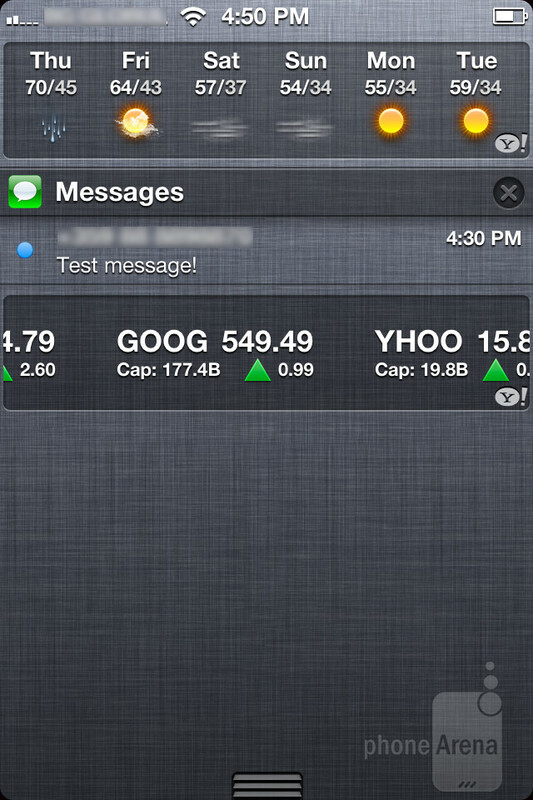 iMessage is a new iOS 5 functionality, designed specifically for iOS 5 users, who enjoy texting a lot. What it does is to let iOS 5 users exchange free text messages, but it doesn't stop there, as they can also exchange images, video, contacts and locations. So, it is a much more advanced service than simple text messaging, with its main limitation being the fact that it's not cross-platform. 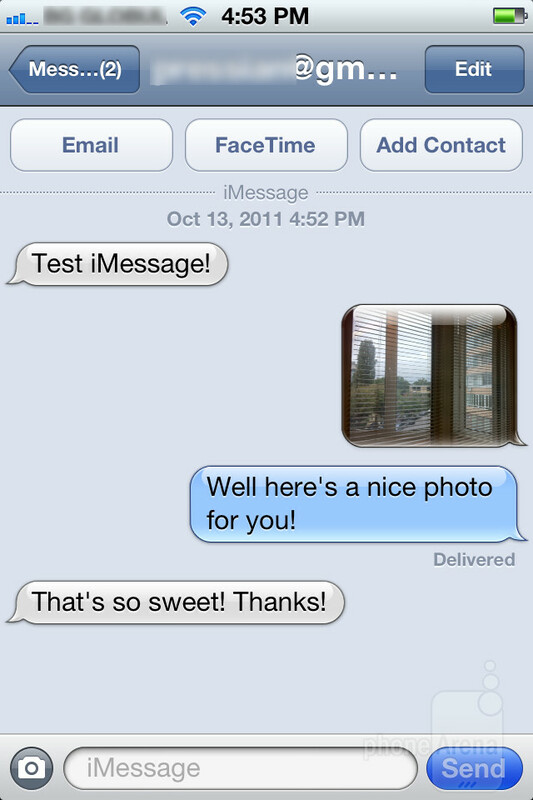 Using iMessage is very easy, as its functionality is built right into the standard Messages application. But, there's even more to iMessage. The service actually allows you to do group messaging, as well to receive delivery and read receipts. Finally, you can also see when the person on the other end of iMessage is currently typing their next message. All in all, this is some pretty cool functionality, built right into the OS, which will surely be appreciated by iOS users. Yeah, Apple already offers iBooks, where you can read your books, purchased from the iBooks store, but it has now decided that it should make a separate place, where you can enjoy your favorite magazines and newspapers. 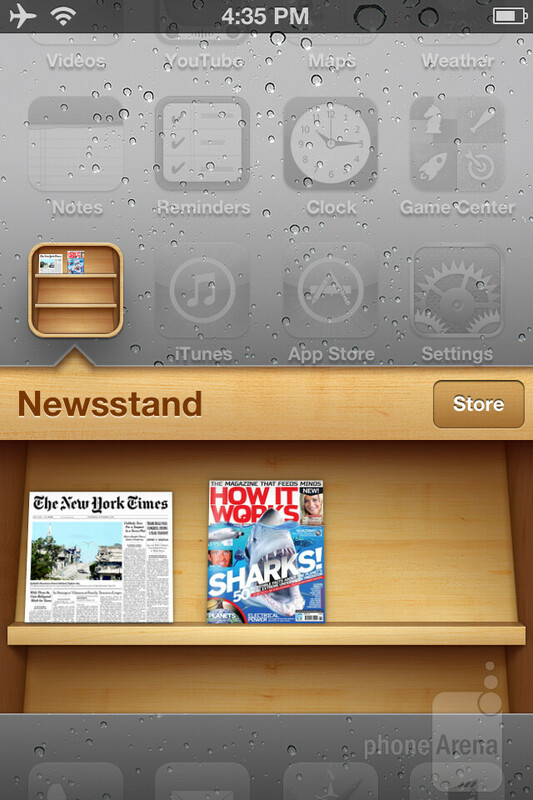 This is the Newsstand app, which comes bundled with iOS 5. In line with the rest of the OS, Newsstand is very easy to use – it actually acts like an app folder, but instead of apps, what you see inside are your magazines and newspapers. There's also a Store button on the right, which takes you directly to the place where you can purchase new content and subscriptions. Thankfully, you can set Newsstand to automatically download your issues for offline viewing, which is a must-have feature, when we think about it. Another new app that comes standard with iOS 5 is Reminders. 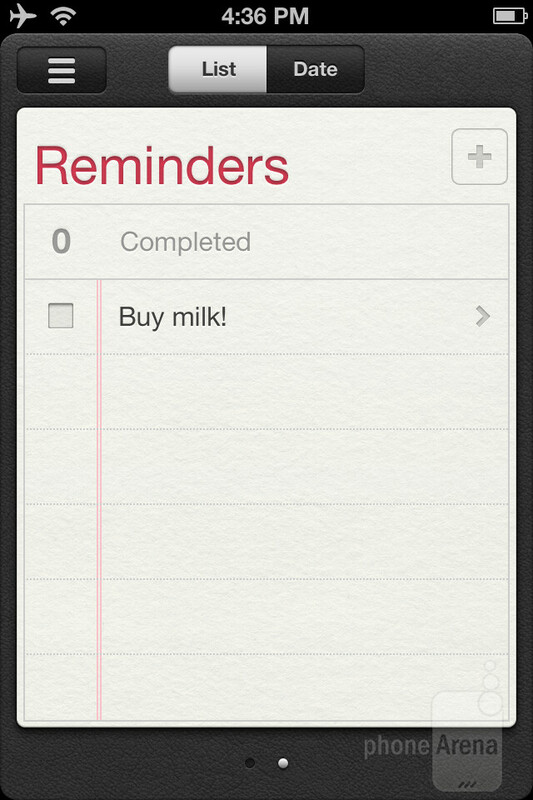 It does exactly what it says – lets you create reminders. However, Apple has once again offered its own approach to doing things, as you can not only set basic reminders, but tie them to specific locations. For example, you can set your phone to remind you to call your wife when you leave work. Since Reminders will be using your location, it will be able to tell than you've left your work address, and thus – fire the alarm. Pretty neat stuff, although you'll have to spend a few minutes to set it all up. Of course, you can just make the phone remind you of something on a particular day and time, plus, you have the ability to set priorities and add notes to your reminders. When you factor in the fact that you can use Siri to set your reminders more easily with the iPhone 4S, this could really speed up the whole process and make you want to use the app more often. Not less important are all the enhancements that Cupertino has done to the Safari mobile browser and the Mail application. First up, Safari has gotten a new Reader option. Here's how it works: imagine you opened a web page with an article in the browser. There will be a button called Reader that would appear right on top of the address bar. Upon clicking it, your article will be taken to a completely different environment, where you'll be treated to nothing else but your article – no other distractions. In addition, you'll be able to tweak the font size easily. Once you're done with your reading, just hit the Done button, and you'll be taken back to the article's web page. Another new Safari feature is Reading list. What is it for? When you've visited an interesting web page, but don't have time or do not wish to read it currently, you can simply send it to your Reading list, by choosing it from the sharing options. This way, you'll be able to easily open the desired web page later, by visiting your Reading list, which is simply a place in your bookmarks. This feature probably won't be used that much, but it's still good to have. Of course, there have been made some obvious speed improvements to Safari, as it now loads web pages significantly faster. And, if you are a lucky iPad owner, with iOS 5, you'll finally be able to have multiple tabs open in Safari. The improvements that the Mail app has seen aren't really dramatic, but still they do add some conveniences. For example, you can now very easily move contact addresses between the To, CC and BCC fields by drag-and-drop. Probably the most significant addition here is the ability to use bold, italic and underline for the text of your emails. We actually aren't blown away by Apple's implementation here. In order to use any of these tools, you have to double-tap on a word and select the full part you wish to manipulate. Upon doing that, you'd notice the well-known Cut, Copy and Paste buttons that appear on top of your selection. What you have to do then is swipe to the left over these buttons, which would reveal some new options like “BIU”, “Define” and “Quote Level”. 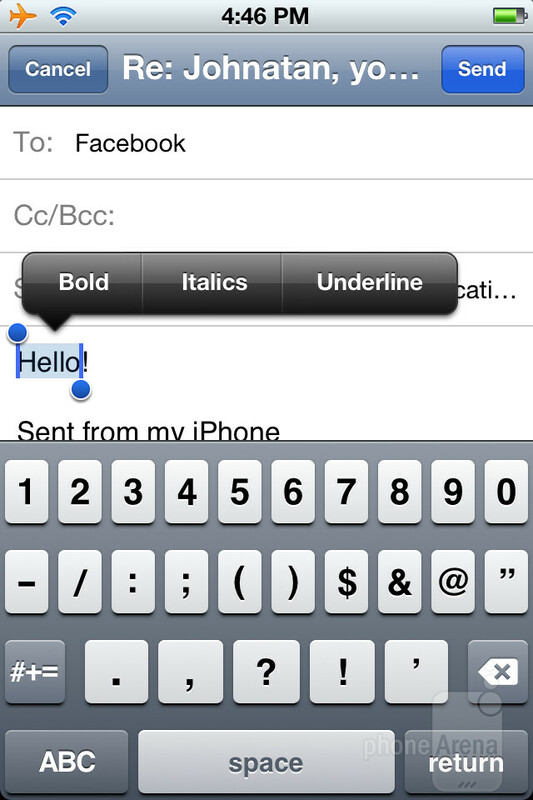 So you have to do one more action (tap on “BIU”), in order to finally get to the Bold, Italic and Underline options. Obviously, this seems like a lot of steps to us to get to such simple tools, which should be available in a more easy-to-access place. Remember that new camera shortcut on the lock screen? Well, it turns out that it's only visible when you double-tap the home key. The good news is that even if your device is completely locked (screen is black), you can still quickly press the home key twice, and it will get you to the lock screen with the camera shortcut visible. From then on, you'll be able to take pictures using the new camera shutter capabilities of the volume up key. Nice! It makes the photo taking process feel like on a normal camera, especially when you consider the clicky nature of the key. 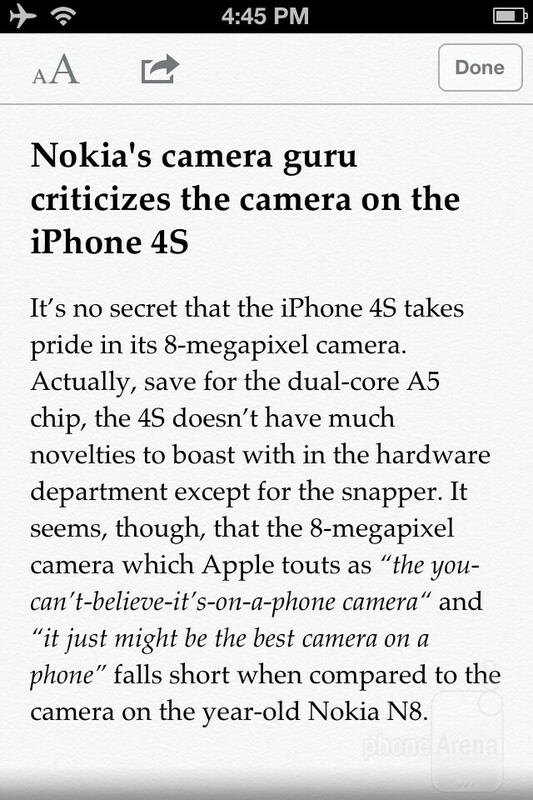 Well, you won't have a half-way stop position for the autofocus to work, but who needs that with the iPhone anyway. 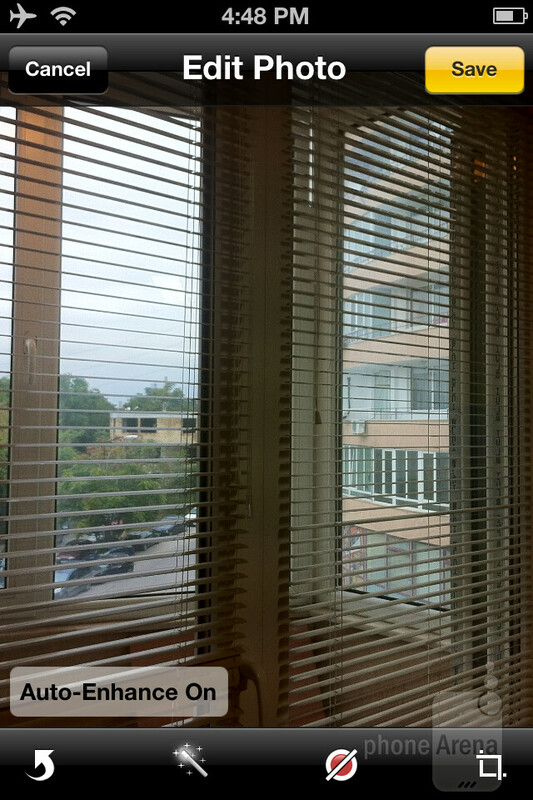 While we are on the topic of photos, with iOS 5, you can now perform some basic image editing, finally. It works like this: you open a photo and there's an Edit button in the upper right corner. When you tap on it, you'll be treated to the following options: Rotate, Auto-enhance, Red-eye reduction and Crop. It doesn't take a genius to guess what all of these do, however, we aren't particularly big fans of the Crop feature, which felt a bit clumsy when we used it. 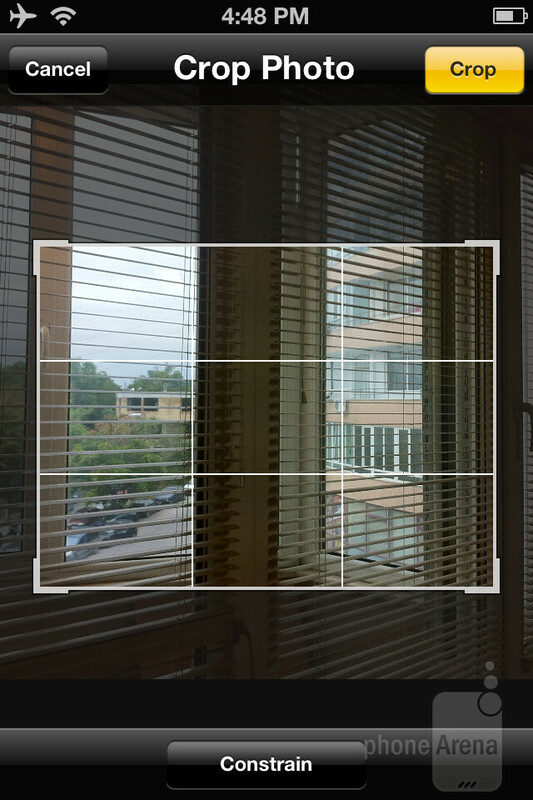 Additionally, most of the time Auto-enhance manages to improve your photos, but it's not a secret that you can find some much more capable tools in the App Store. Twitter is actually the first social-networking service to be deeply integrated with iOS. 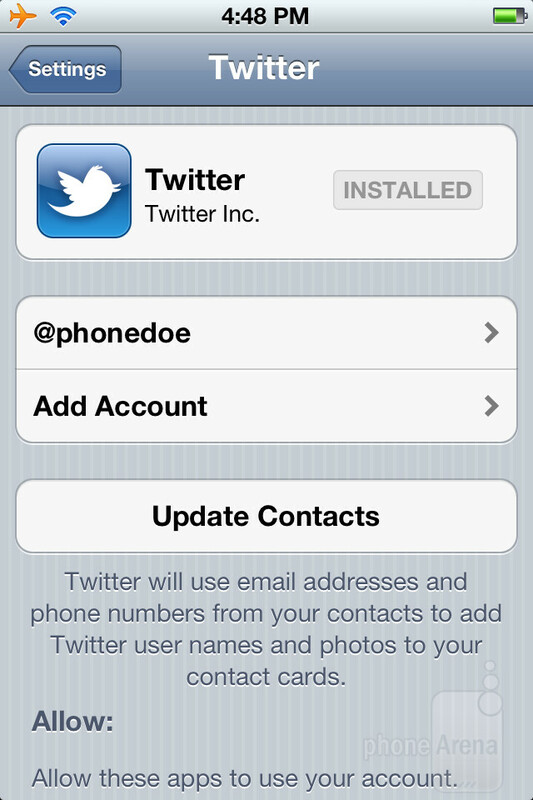 Now, with iOS 5, you can quickly share something on Twitter from pretty much everywhere. Not only that, but there's also some Twitter integration with your contacts – you can update them with user names and photos from Twitter. The whole thing works after you do a one-time sign-in with your account from the Settings app (you also have to download the Twitter app). From then on, your iPhone will be Twittified, so to speak. iOS 5 makes a difference when it comes to cutting the wires. First of all, you can now activate your iOS 5 device without the need of a computer, which is great. But even better is the option to sync your device with iTunes, without the need of a cable. You just need both devices to be on the same Wi-Fi network, and voila – you can sync apps, music, video and various settings just like that. Overall, we agree with Apple that iOS 5 is a pretty major release – there are a lot of new features, some of which being very significant, like Notification Center, iMessage and iCloud. Of course, iOS is not perfect yet, there could be more widgets for the Notification Center, and those app icons could really get a bit more dynamic. But for now, this will certainly do. We're happy that Apple provides such strong support for its devices, as it has brought iOS 5 to not only the iPhone 4S and 4, but to the aging 3GS as well. So, you learned what we think of the new iPhone OS, but it is now time for you to share your very own thoughts about it, using the comments below! Feel better now? I have a Droid X2 (that crashes every day). I'm getting an iPhone for something more reliable. I went through 2 DX's and the DX2 - the Droids with Gingerbread are just plain unreliable. - Want a reliable OS and patch updates that don't take 6 months? DROID CAN'T - Want to sync Google tasks? DROID CAN'T - Want to take good pictures? DROID CAN'T - Want long battery life? DROID CAN'T - Want apps that don't look like crap? DROID CAN'T I have had Droids since the OG, and the OG was a high quality device. Ever since then, they have released crap. Buying an Android device today is like buying a fancy spec house in a ghetto. Cree I love you ! I completely agree with your analysis ! BTW, I am waiting impatiently for the Nexus Prime. 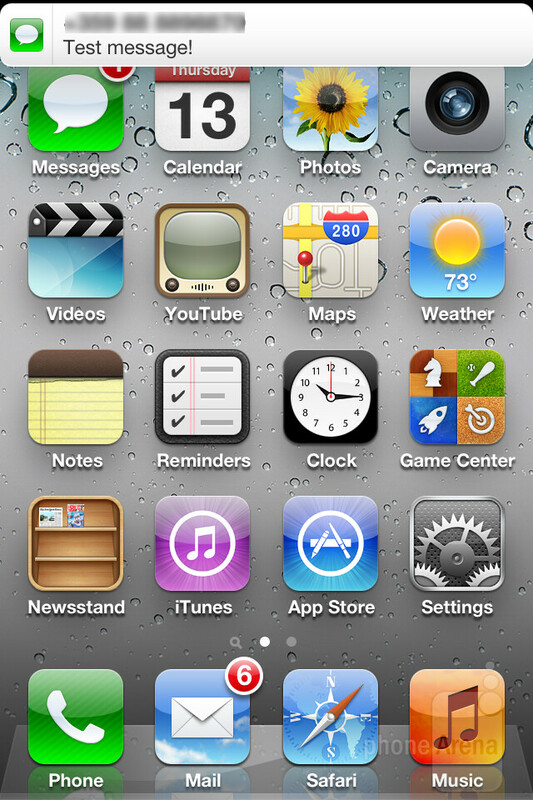 Almost considered the Iphone 4s because it's pretty,(yes) despite the small screen. It has a great camera. BUT, Iphone lacks 4G, 4+ inch screen and it's considered just an application launcher. I really don't understand that but I equate that to 14k gold jewelry versus 14k gold plated jewelry. without hitting 5 other letters? Stop eating McDonald's food. Unless you are overly obese, it's not hard to hit just 1 button on the iPhone keyboard, even when in portrait mode. Around here no phone can get lte service so I don't give a crap. So what if it's been around longer? Looks like siri is quite a bit better. First doesn't mean it's better. iOS is customizable enough for most people. Just because it's trendy doesn't mean it's bad. Want an OS that has really gotten everything together and has quite a bit of polish? iPhone has had this since iOS 1 (or then called iPhone OS) while Android is still not quite there Want a customizable notification system? iPhone can. Want something that can actually fit in your pocket? iPhone can Want highest resolution on a phone? 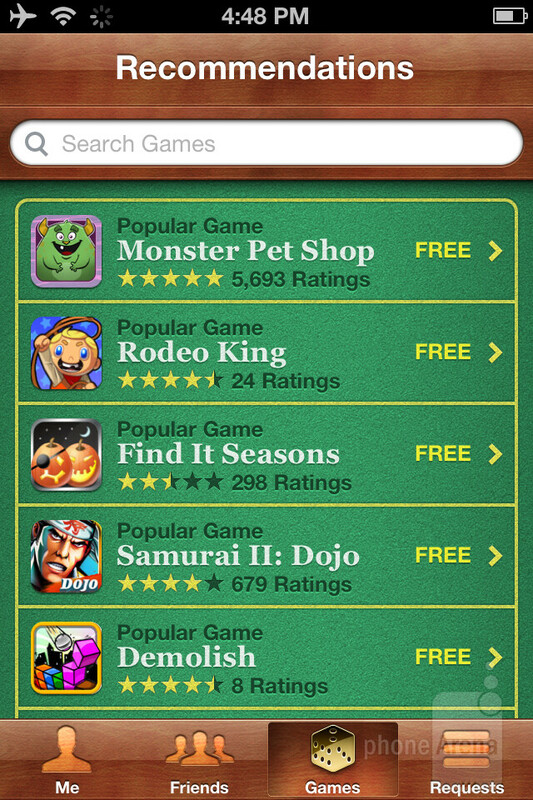 iPhone can Want a place where there are no viruses in the app store? iPhone can. LOL you just made me laugh. U said u had the original droid and thn u went to droid x .. nd thn droid x2.. and now gettin iphone 4? how many upgrades do you have? 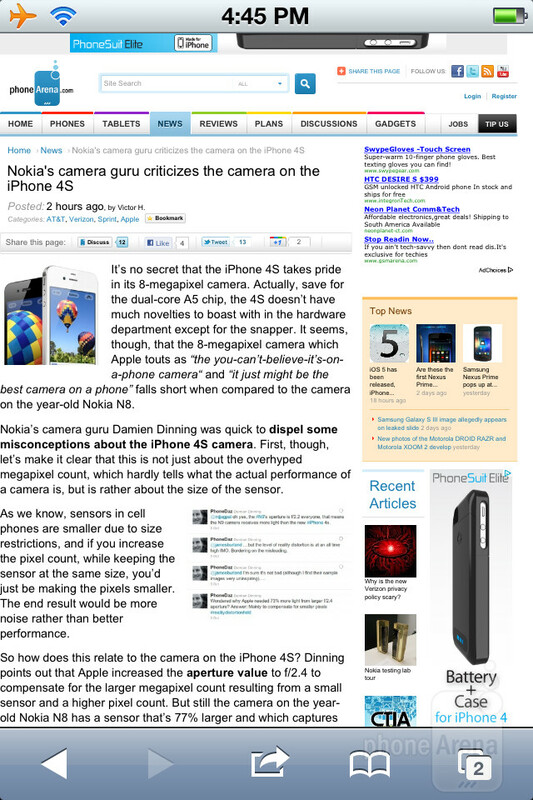 and if u r buyin full retail price, why didnt you buy the iphone 4 which came before droid x2? You, my friend are just a hater. Iphone 4, has been the most unstable phone i ever seen. Every day i get a customer with an issue or two with different phones ( but android, basic, or blackberry) i could understand, why different manufacturing companies would have problems with android system, prolly the hardware is not optimized, yet. But iphone and IOS has been in market for a while they must have a polished OS, but i still see issues, as i have mentioned in my previous posts, like Iphone blacking out and does not turn on, or the speaker does not work, you can not hear other ppl but they can hear you. lets not bash Android or IPHONE. Find and discuss what could be doned bettter with both parties. That analogy is just horrible. I have news for you, you can stream a movie on the Iphone without purchasing it and you can also create a custom ringtone on the iphone in seconds if you know what you are doing and with ios5 you can use it as a text alert tone as well. I hate when people don't know what they are talking about. The flash memory intigraded in the Iphone is a smarter idea. I can't count how many people have issues with their phones corrupting their memory cards. With Iphone, you will never have that happen. At least you are guranteed that the Iphone will work out of the box.. Not so much with any Android device. you kiddin me with this??? ios crushes android!! anyday!! most people dont know that android CAN do ALL of it! Apparently most people also don't know that it is not a crime to have a preference. Some like Android, some like IOS. I don't know why people get so defensive over a phone. Relax enjoy what you enjoy. They sue because they're first and people believe they're first. Well, they are not in this one. Exactly! I like,and have both. most people don't know that most of it was copied form Android. . . he who cries copycat the loudest is often the real copycat. even the ipad now gets a thumb type keyboard--hope the dev that developed that gets some $$ but s/he probably won't. Not everything, last time I checked Android didn't have any free messaging service like iMessage. No Android phone has anything close to what iCloud has. Either way, as Hallucinator said, some like iOS, some like Android. Cheers! every feature on the new iOS5, android indeed has a counterpart but the implementation, stability and the design of these android counterparts make them look like android is running in beta.